It's everyone's favorite green princess! In addition to being a supermodel and TV personality, Heidi Klum also specializes in Halloween. The star has been known to take the holiday very seriously and hosts an annual star-studded bash, where she and her guests can show off their impressive costumes. Such was the case once again on Wednesday night when famous faces gathered at NYC's Lavo to party the night away in character. 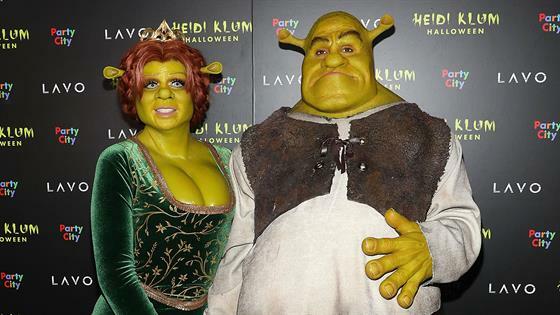 While guests like Neil Patrick Harris and Lupita Nyong'odefinitely got into the Halloween spirit in their spot-on looks, it was Klum who took Halloween to the next level once again by transforming into Shrek's Princess Fiona. After teasing fans with videos and photos of the prosthetic process, the star made her grand arrival alongside her Shrek, boyfriend Tom Kaulitz, in none other than a carriage. Bonus points for keeping on theme, you two! Looking exactly like the iconic animated film duo, the pair posed for photographs on the red carpet along with some sweet props: their baby ogres. Soon, it was time to make their grand entrance into the party, sponsored by Party City and Svedka. According to an insider, the two stepped into the party as the DJ played the movie's signature song, "I'm a Believer." After taking a spot next to the DJ booth onstage, Klum greeted the crowd. "Hello everybody! Have a lot of fun everyone. Be safe and have a lot of fun!" she encouraged all of the guests. While they did their best to dance in costume, it wasn't so easy for Kaulitz. "His costume was so wide," the source described. "He just kind of waddled around and grooved." Not to fret, the two appeared to have a great night out with plenty of PDA. "They held hands here and there and it was very sweet," the source noted. To top it all off, they got to party with the OG Shrek, Mike Myers, who also attended the bash. It seems it was another year of impressive Halloween fun for Klum and all of her friends. This morning, we just hope she made some waffles. To see more of the costumes from her star-studded soirée, check out E! 's gallery above.